We had the women in white in congress the other day, interestingly, there have been "women in white" protesting against the Cuban regime for years and years and now, spreading to Venezuela. So, I'd say unrelated. Cúcuta (Colombia) (AFP) - The soldiers blocking humanitarian aid from entering Venezuela look unlikely to give any ground, but Maria Acevedo thinks she knows how to make them let the shipments through. Okay, "Ladies in white" in Cuba since 2003. A lot of times, I've seen pictures of them in Cuba being hauled off to jail! A whole different phenomenon than that in the Capitol the other night. Re: Could women in white sway Venezuelan soldiers blocking aid? The story certainly does try to draw the parallel. 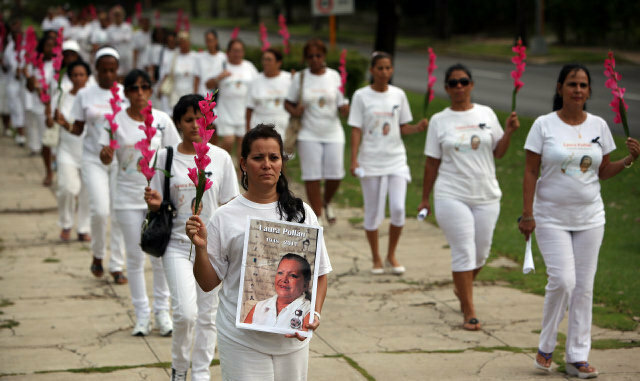 The women protest the imprisonments by attending Mass each Sunday wearing white dresses and then silently walking through the streets dressed in white clothing. The color white is chosen to symbolize peace. The context does seem quite different in Cuba.